This is looking like a cake just for the connoisseur rather than a crowd. Initially attracting a lot of admiring glances, my trusty cake box hadn't had its lid removed once by the time I lifted the lid today. I'm assuming that perhaps people were put off by the flavour rather than that they were just snubbing me and my cake. But it's their loss because with just three more days at work before I bring this challenge to its conclusion, it's the very last time they'll be getting cake. Coffee cake is admittedly a bit of a marmite choice. You either love it or hate it. In a room of a hundred people, you'll probably have around half of them eschewing coffee in favour of tea or soft drinks. Working in IT as I do and being one of the many who mainlines caffeine on a regular basis, I figured that this slight boundary push was a risk worth taking. And so far, it's spectacularly failed. Much as they eat a lot of cake, they don't have a passion for Dan Lepard cakes as I do. Or at least they really like them, but couldn't care less whose recipe it is that I'm using. The recipe is one from the Guardian website and I chose it purely because I was interested in the flavour combination. Having baked the sponge late yesterday, I was up at 5am icing it. For once, I cut a piece out of the whole cake for photographic purposes and I decided to try a bit as I was curious. The flavour combination works. My brain struggled a little to compute all the flavours as they were going in but it works so well together, the cake is a taste sensation for anyone who doesn't think that Mr Kipling is the be-all and end-all of cake making*. 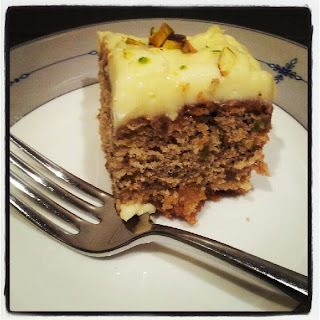 Filled with chopped pistachios and both fresh and stem ginger; and speckled with real, rather than instant coffee, the flavours are subtle enough to compliment each other and the lemon-cream cheese icing on the top adds another subtle dimension. Coffee cake is one of my all time favourites and if I'm honest, I'd probably make a bog standard coffee sponge with coffee buttercream for nine out of ten coffee cakes but this is definitely something I'd share at cake club in the future. The cake was slightly drier than I would've expected but this may be to do with me baking it in a rectangular rather than the recommended square tin. I had to extend the cooking time a little to ensure it cooked through and of course, it's the corner pieces that always pay the price for an extended baking time. Lesson learned - but the square tin had my disasterous marshmallows in it. If you fancy testing your cake connoisseur credentials, you can find the recipe here. Ooh that sounds such an interesting cake. Am bookmarking that one to try.